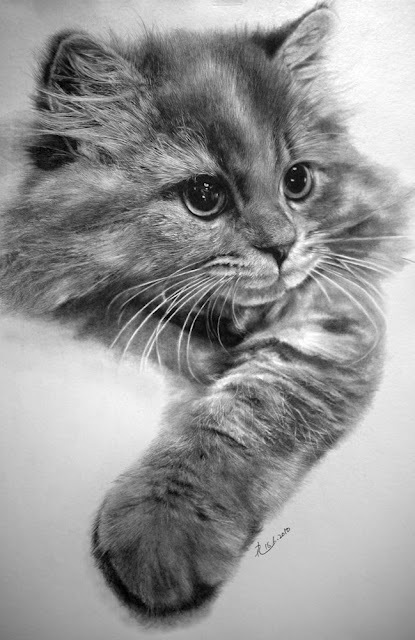 Everything Is Art: Painting of the Day: "Miu Chu"
One 4B pencil. 45 hours worth of work. The above is the result. I just love tonal drawings, where all colours are removed– it's just composition, expression, and the artist's technique. Humans have emotional responses to colours. By taking that away, you have to have a very strong composition and subject matter to invoke a "wow factor" from your viewers. You can clearly see how different the texture of the fur is when compared to the eyes of the cat. She (he?) is a darling, and what's more, I love cats. Good usage of perspective to add depth to the piece too. Visit Paul Lung's DeviantArt here.